Surpic is based in the regency town of Cheltenham, United Kingdom, 100 miles west of London and at the centre of the UK and its electronic communication network. Cheltenham is England's most complete Regency town and is characterised by intricate ironwork balconies and painted stucco facades and is well known for its race track and impressive range of stylish shops and restaurants. Cheltenham has excellent transport links by car, rail and air. It is located adjacent to the M5 motorway, has a direct rail link from Birmingham New street and is within easy reach of both Bristol and Birmingham airports. In recent years Cheltenham has become an integral part of the UK electronic communication network and with its culture, scenery and transport links makes it an ideal location for a technology based company. 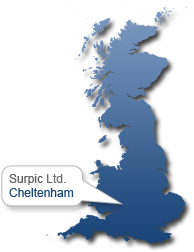 Surpic Limited, 25 St Georges Road, Cheltenham, Gloucestershire, GL50 3DT, United Kingdom.